Our Ezislider is a compact, easy-access shed for your lawn mower, bike or any similar home or sports equipment. Its 3-metre width gives you enough room for storage but its design and dimensions lets you place it even under eaves and some narrow areas. 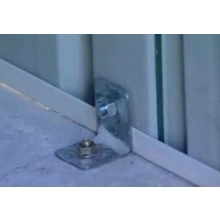 It’s ideal for use in carports and garages in unit complexes. Plus the sliding double doors allow you to go in and out of the shed freely. 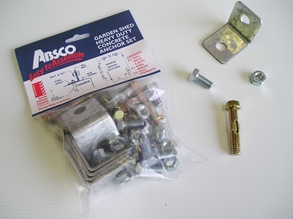 Like other ABSCO Sheds, the Ezislider is made of quality steel – Colorbond for this one. You can be assured that the paint won’t chip or fade easily. And with the use of SNAPTiTE system, you can build this shed in less than a day without any need for professional assistance. It’s the shed to choose if you want one that is compact, but not cramped, and costs less even in installation and maintenance. • Windows and Skylights are not suited to this model due to its size. 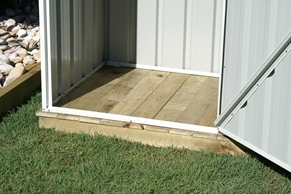 • OZKIT Timber Flooring is not suited for all sheds with sliding doors, such as this model.